The flexible flow meter is designed to permit easy disassembly, cleaning, and reassembly. It is ideal for equipment that must be disassembled for maintenance. Users can change the flow meter tube only without changing the block. - Easy disassembly and reassembly It can be disassembled just with a screwdriver and wrench. This flow meter is ideal when frequent cleaning or tube change is required. - Sophisticated design Equipped with many shaped component parts and an alumite body with a satin finish, the product has a sophisticated design. - High-precision flow meter A high-precision flow meter tube equivalent to that used in the precision flow meter RK1450 is used. 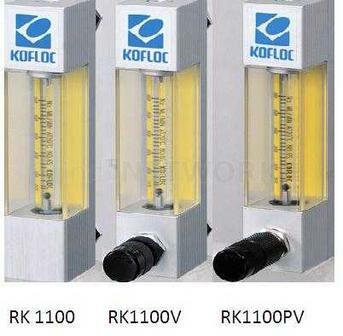 - Models (1100V and 1100VP) equipped with a valve are also available. The models with a needle valve come in two types – a precision needle valve type 1100PV and a simplified needle valve type 1100V.